¿Está por Vencer su Número de ITIN de Acuerdo a las Nuevas Reglas del IRS? Muchas personas en la Comunidad Promesa de la Mission han escuchado que hay unos cambios del Servicio de Impuestos Internos (IRS) acerca de los Números de Identificación de Contribuyente Individual para Extranjeros (ITINs). Estos cambios ocurren porque el Acta para Proteger los Americanos de los de Aumentos de los Impuestos, fue firmada y aprobada como ley el diciembre pasado. Los números de ITIN contienen nueve dígitos que proveen una manera para los trabajadores indocumentados pagar sus impuestos — uno de los primeros pasos importantes para hacerse legal en los Estados Unidos de América. MEDA, la agencia principal de la Comunidad Promesa de la Mission, ha preparado el papeleo del IRS (W-7) para cientos de ITINs para miembros de la comunidad inmigrante Latina en el Área de la Bahía de San Francisco. Este proceso por lo general demora tres meses por los procedimientos y el tiempo de trámite del IRS. Hay una necesidad definitiva para la aclaración de los cambios a los ITINs, para que la desinformación no ocurra en la comunidad. ITINs de 2013-2016: Si su número de ITIN fue emitido desde el año 2013 hasta ahora, no es necesario tomar acción. Su número de ITIN no va a vencer, y no vencerá, a menos que no use su número de ITIN por tres años consecutivos de los impuestos. ITINs de 2012 o antes: Si recibió su número de ITIN en el año 2012 o antes, tendrá que renovar su número de ITIN, basado en el año que su número de ITIN fue emitido (vea la tabla siguiente). Si necesita renovar su número de ITIN, por favor llame a MEDA ahora mismo al (415) 282-3334 ext. 178 para hacer una cita gratuita. Le sugerimos a usted que no espere hasta la próxima temporada de los impuestos que empieza en enero de 2017, cuando está muy ocupado en MEDA. Es mejor renovar su número de ITIN antes del fin del año 2016. Para determinar el año que recibió su número de ITIN, vea la carta original, verde que recibió. La fecha está ubicada en la esquina derecha hacia arriba de la carta, como mostrada en este ejemplo. Si necesita renovar su número de ITIN este año, usted y un estimado 400,000 otros contribuyentes recibirán un aviso del IRS que se ve como este ejemplo. 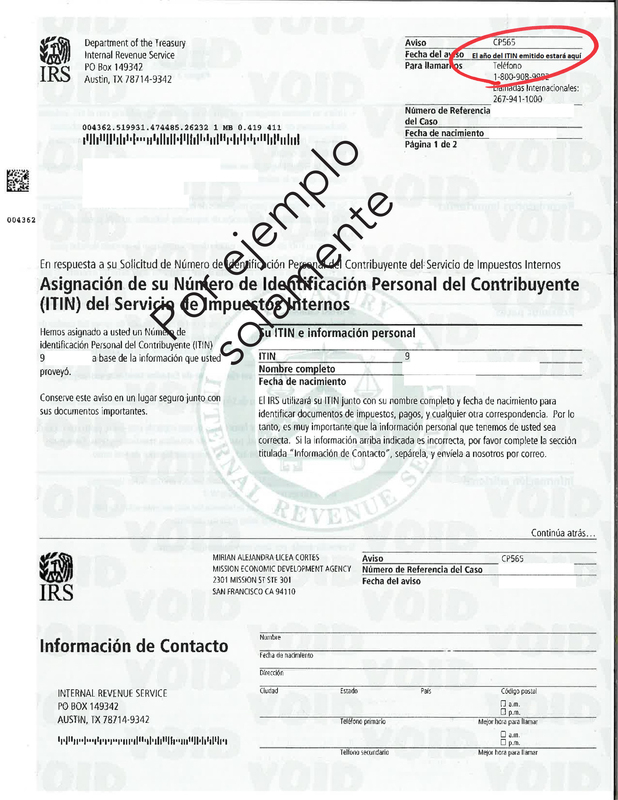 Si su número de ITIN vencerá este año, y si el IRS no tiene su dirección actual, esto sería la única razón que quizás no recibirá la carta. Si su número de ITIN vence este año y no lo renovará antes del 31 de diciembre, 2016, puede renovar su número de ITIN cuando haga su declaración de los impuestos en 2017; pero no es recomendable porque esto puede resultar en un retraso de su posible devolución de los impuestos. Todos los leyes mencionadas aplican a su esposo(a) y sus dependientes quienes ya recibieron sus números de ITIN. ¿Todavía está confundido si su número de ITIN esta por vencer? Por favor contactar a MEDA al (415) 282-3334, ext. 178. El equipo de los impuestos está aquí para ayudarle — sin costo alguno. Is Your ITIN Expiring, Per New IRS Rules? Many in the Mission Promise Neighborhood community have heard that there have been changes from the Internal Revenue Service (IRS) regarding Individual Taxpayer identification Numbers (ITINs). These changes are occurring because of the Protecting Americans from Tax Hikes (PATH) Act, signed into law last December. Nine-digit ITIN numbers provide a means for undocumented workers to pay their taxes — an important first step to becoming legal in the United States. MEDA, the lead agency of the Mission Promise Neighborhood, has done ITIN paperwork, at no cost, for hundreds of ITINs for the habitually underresourced Latino community in San Francisco’s Mission District. This is generally a three-month process because of IRS procedures. There is a definite need for clarification of the changes to ITINs, so that misinformation does not occur in the community. 2013-2016 ITINs: If your ITIN was issued from 2013 until now, there is no action needed. Your ITIN is not expiring, and it will not expire unless you do not use your ITIN for three consecutive taxable years. 2012 or earlier ITINs: If your ITIN was received in 2012 or earlier, you will have to renew your ITIN, based on the year your ITIN was issued (see table following). If you need to renew your ITIN, you should call MEDA right away at (415) 282-3334 ext. 178 for an appointment. You are encouraged to not wait until next tax season that starts in January 2017, when it is very busy at MEDA. It is best to renew your ITIN by the end of 2016. You can determine the year you received your ITIN by looking at the original, green ITIN letter you received. The date is in the upper right-hand corner of that letter, as shown in this sample. 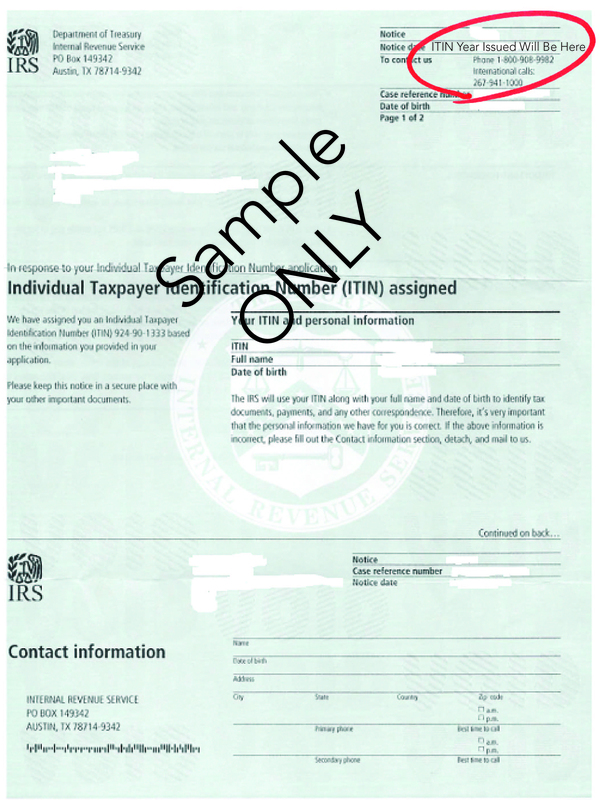 If you need to renew your ITIN this year, you and an estimated 400,000 other taxpayers will receive a notice from the IRS that looks like this sample. The only reason you may not get the letter, if your ITIN is actually expiring this year, is if the IRS does not have your current address. If your ITIN expires this year and you do not renew your ITIN by December 31, 2016, you will be able to renew your ITIN when you do your taxes in 2017. This is not recommended because this will result in a delay of your possible tax refund. All of the above rules apply to your spouses and dependents who have been issued ITINs. Still unclear if your ITIN is expiring? Please contact MEDA at (415) 282-3334 ext. 178. The MEDA tax team can help. MEDA Tax Program Manager Max Moy-Borgen received some exciting news when contacted by the Internal Revenue Service (IRS) last December. It turns out that MEDA had been chosen for an innovative Individual Taxpayer Identification Number (ITIN) pilot program – just one of three sites in the nation selected. MEDA is the lead agency of the Mission Promise Neighborhood. A nine-digit ITIN is a tax-processing number issued by the IRS so that people working in the U.S. can file a federal tax return without a Social Security Number. Moy-Borgen knew that his years of building four culturally competent Volunteer Income Tax Assistance (VITA) sites in San Francisco had led to this honor, with free tax prep for Mission Promise Neighborhood families a big part of the services offered. The gist of the pilot program is that MEDA’s status as a Certified Acceptance Agent (CAA) for the IRS has been expanded. This means that whereas before a dependent’s original passport or National ID Card would need to be mailed to the IRS with an ITIN application, photocopies of either of these documents will now be accepted. Before this pilot program, photocopies sufficed solely for primary and secondary taxpayers. The genesis of this prospective streamlined process is based on the IRS having confidence in MEDA’s best practices around free tax preparation in San Francisco. This includes ITIN preparation, for which MEDA annually assists about 200 clients. They will now negate the risk of losing their dependents’ original documents – a nightmare situation for anyone. Moy-Borgen has seen such unfortunate incidents in the past, with the IRS claiming they never received a client’s original passport or National ID Card. What is currently a three- to four-month process will now be expedited. The reason is that just one point of contact, a supervisor in the IRS’s Austin, Texas office will be receiving the ITIN applications from MEDA, offering priority to these color-coded applications coming from the organization. Think of it as direct service rather than the possibility of getting lost in a bureaucratic maze. It’s not surprising that the IRS is looking to streamline its ITIN-application process after two decades of the program’s existence. According to the IRS, in 2010 over 3 million federal tax returns were submitted using ITINs, with those filers paying $870 million in federal income taxes — a direct benefit to the federal coffers. ITINs can also be used in other ways. Under the U.S. Patriot Act, provisions mandate that financial institutions collect information on their customers’ identities, and an ITIN suffices to open interest-bearing accounts. Also, an ITIN holder can secure a driver’s license in some states. Additionally, an ITIN can be used to establish or improve credit through MEDA’s Secured Credit Card with Self-Help Bank, with financial institutions even starting to use ITIN’s as a way to open credit cards, loans and mortgages. Moy-Borgen is hoping that with the anticipated success of this pilot program, expansion to VITA sites nationwide will occur next year. Are you a Mission Promise Neighborhood family ready to get your ITIN or taxes prepared? Call (415) 282-3334 ext. 178 for your appointment for free tax prep in San Francisco. Special thanks to the City and County of San Francisco-Human Services Agency, United Way of the Bay Area and Bank of the West for helping low-income residents do their taxes at no cost. EITC: those four letters sure mean much to the low-income community of the Mission Promise Neighborhood. The term is so powerful that there’s even a day named for it. That would be “Earned Income Tax Credit Awareness Day,” which is today. “Earned Income Tax Credit Awareness Day” is the brainchild of the IRS and is a federal strategy to foster a national grassroots movement to ensure those most in need know that EITC is a major tool for asset building. Enacted in 1975, there have been four legislative expansions of the EITC. In this time of bipartisan strife on the Hill, it is interesting to note that those on both sides of the aisle have championed this safety net that rewards work. Take the fact that three decades ago President Reagan, a conservative, actually proposed an expansion of EITC, knowing its value. A Center on Budget and Policy Priorities October 2015 report, “EITC and Child Tax Credit Promote Work, Reduce Poverty, and Support Children’s Development, Research Finds” showcased the impact of the EITC. U.S. Census data from 2014 show a $75,604 median household income in San Francisco. Conversely, our Mission Promise Neighborhood survey conducted in the same year concluded that 76 percent of respondents in that community made under $35,000 per year, with 90 percent making under $50,000 per year. Most of these families would qualify for the EITC. On a statewide level, California now offers Cal EITC, starting with the 2015 filing year. While the income levels for eligibility are much lower than the federal income levels, those who do qualify can possibly get another $2,653 added to their refund. To meet local need, San Francisco now offers a Working Families Credit, whereby qualifying low-income families can earn a one-time only additional credit of $100 if paid via a paper check or $250 if paid by direct deposit. The program was designed to encourage families to avoid check-cashing fees by opening bank accounts, which MEDA can do for clients who do not have one. MEDA advises all clients to apply, even if they are unsure if they qualify for this credit. MEDA, the lead agency of the Mission Promise Neighborhood, runs what is now the largest free tax preparation program in San Francisco, with clients seen at Plaza Adelante and three other Volunteer Income Tax Assistance (VITA) sites in the city that the nonprofit oversees. It’s interesting to note the history of VITA. Back in 1970, Gary Iskowitz was doing graduate work and teaching tax law at Cal State–Northridge, while also working for a tax agency. Iskowitz saw a growing problem with questionable tax preparers scamming low-income people, so he approached the dean at Cal State–Northridge with a plan to give him 10 students to whom he would teach a 24-hour class in tax preparation, at no cost to the university. In return, Iskowitz asked the university to nullify the students’ tuition for the class, as they became volunteers doing free tax returns for low-income community members. People lined up around the block waiting for this free tax preparation service. Iskowitz’ idea became the success story for what had started in 1969 as a small federal program of the IRS. Decades on, millions now receive free tax prep from volunteers nationwide, with sites ranging from nonprofit social services centers, such as MEDA’s Plaza Adelante in the Mission, to military bases. At MEDA’s four VITA sites, Tax Program Manager Max Moy-Borgen sees his team of staff and volunteers harness the power of the EITC every day. 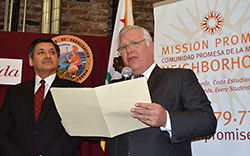 Moy-Borgen also sees the gaps for Mission Promise Neighborhood families. For example, undocumented Individual Taxpayer Identification Number (ITIN) holders are not eligible for such credits. The same goes for cash-income only clients with regards to the Cal EITC only; furthermore; most of the credit usually goes to reduce the client’s self-employment tax burden. For the San Francisco Working Families Credit, you do not qualify without at least one eligible dependent child on your federal income tax return. This combination makes it difficult for some low-income, single clients without dependents to make ends meet, as the income limit and credit amount is significantly reduced without children. Regardless of their situation, Moy-Borgen’s team is well versed in all IRS situations that pertain to the low-income community, making sure maximum refunds are obtained for Mission Promise Neighborhood clients. This led to over $4.5 million being returned to the community last year … with 2016 looking equally impactful. Are you a Mission Promise Neighborhood ready to get your EITC tax credits? Call (415) 282-3334 ext. 178 for your appointment for free tax prep in San Francisco.